Elesta, a traditional Swiss manufacturer of regulation equipment, offers a line of regulators for economic and comfort control of a wide range of applications, from simple applications to most complex systems involving several heat sources and many heating circuits. The regulator keeps evaluating both the room temperature and the outdoor temperature and calculates an optimum heating mode and boiler operation. The regulator uses continuous evaluation of both inner and outer temperatures and heating water temperature for determining the characteristic of the building and for continuous modification of the optimum heating mode. This ability of the regulator to learn and subsequently optimize further regulation calculations is decisive for reaching both comfort and economy of operation. The regulators are manufactured in many executions for various typical applications, each regulator has many adjustable service parameters. Thanks to it, the regulator can be configured ideally for a specific heating system and wishes of the users. Besides heating it can control warming sanitary water, pool water, pumps and valves of mixing circuits, switch or connect another heat source or boiler cascade, protect your boiler against low-temperature corrosion by controlling the return water temperature. This all is reached with simple handling and user comfort. Eeasy setting by means of potentiometers. Controls a boiler, mixing valve and warms up DHW (type-dependent). Clock selection – analog daily, weekly, or digital. Frost protection of the whole heating system. Room remote control can be used. Comfort control by means of a keyboard and display. Control of boiler, mixing valve and DHW warming with circulation according to time schedule. DHW protection against Legionella bacteria. Room remote control can be used, “holiday mode“ offers an easy transition to setback mode for times when you are e.g. on holidays. Can be connected into complex regulation systems via bus interface. Programming may be done both digitally and from a computer. Up to 4 heat sources and 7 mixing circuits can be controlled. DHW warming in time mode. Each boiler in a cascade may have its separate control of return water temperature. The regulator can control warming DHW through solar collectors and in case of insufficient temperature it starts a boiler to heat water in the tank. The circulation pump is switched on when the water in collectors reaches higher temperature than in the tank, and in case the collectors cool down, the pump goes off. The function of tank cooling can be used when critical values are exceeded. The regulator controls mixed heating circuit. In case when more mixed heating circuits shall be controlled, the regulator enables connecting a module for mixed heating circuit. One regulator can serve max. 7 mixed heating circuits. Heating curves, required temperatures and weekly time schedules can be set differently for each circuit. The regulator can control a heating system that will use to maximum alternative energy sources. When solar collectors, a heat pump and a back-up electric boiler are installed, the regulator will prefer using the solar heat first for DHW and then for heating (vice versa also possible). When solar energy is insufficient, the heat pump is switched on. Only for very low outside temperatures, when even the heat pump is not sufficient, the electric boiler is switched on. The accumulation tank may be used also for pool heating and the regulator will ensure switching the appropriate source. Boiler cascade may be controlled by additional boiler modules that communicate with the regulator. For protection of boilers and thermal dissipation decrease, the min. temperature of return water can be controlled either separately for each boiler, or jointly for the whole cascade. In case of 2-stage solutions, switching can be set either to first stages first and then the second stages, or full output of the first boiler first and only then the next boiler. 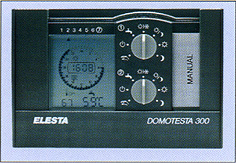 We supply a whole range of accessories for Elesta regulators: remote controls, modules, sensors, base plates etc.